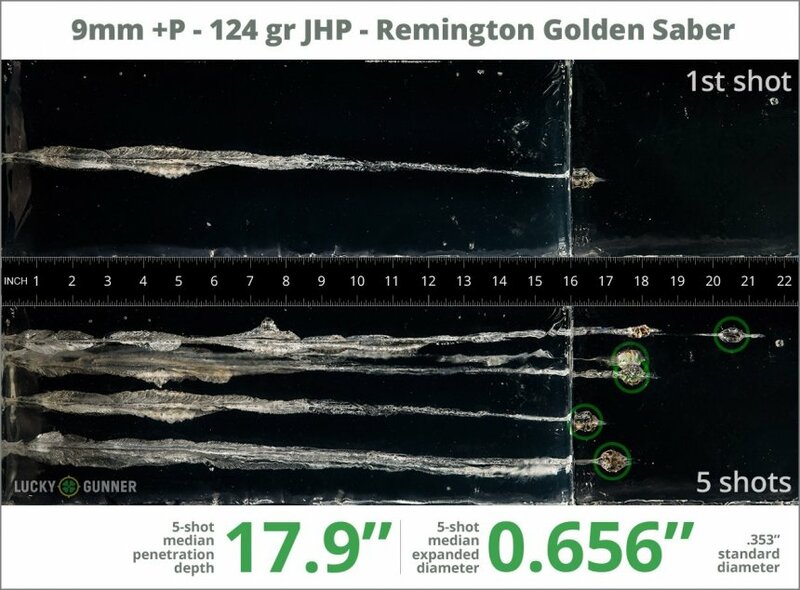 We test fired five rounds of 9mm Luger (9x19) Remington 124 Golden Saber +P into synthetic ballistic gelatin to observe its expansion and penetration characteristics. The ammo was fired from a Smith & Wesson M&P9C pistol at a distance of 10 feet. A four-layer barrier of heavy fabric was placed in front of the gelatin to simulate clothing. Great ammo, even though I have never used it against a personal attack. Thank GOD! Fired from Browning Hi-Power MkIII. No malfunctioning of ammo and easy to require site picture, due to weight of pistol & spring up grade. Low flash as advertised. Excellent round for the money. Can be ordered online for about forty cents a round. I have bought and shot cases of these in my Glock 17 and 26. Never a problem. Fairly accurate and good snap. Accuracy drops off @ 25 yds, but this round expands great in tissue, and the low muzzle flash is a bonus. My accuracy suffers with a wide deep hollow point like this. These bullets expand more than about any other round I have fired into gel, dead cows, or spoiled meat. The round has no discernible muzzle flash from the shooter's viewpoint. I have never been shot at with this round, but I assume there is little muzzle flash from that viewpoint either. Low muzzle flash is a good thing at night. You don't give away your position, or sacrifice you night vision with muzzle flash. That is one thing I really like about this ammo. The fact it saved my life is another. I hit the sidewall of a tire at about 20 yards, after taking out another tire from 7 yards. I did not have a clean shot at the driver, so disabling the vehicle was the other option. With two flat tires the beads broke, and spun on the rims. This kept the diver from being able to run me over, after I retreated into some heavy foliage & vegetation. By then backup had arrived. So, when it counts, you can count on these to go where you need them to go, and do what needs to be done. Practice with these from time to time, because they don't fly quite like a FMJ. Your pattern will open up a little bit, especially at longer ranges. If you are more than 15 or 20 yards away, don't try to do any fancy shooting with these. They are not super accurate. You sacrifice "some" accuracy for the lethallity factor, and the low muzzle flash. STILL A FABULOUS ROUND! +P is a waste in short barrel pistols. Anything less than about a 4"bbl & +P has no appreciable effect. These chrono'ed out about the same as a normal SAMMI spec. round, with little or no increased velocity. So, buy accordingly, for the guns you own & use. The +P actually makes these less accurate in guns where +P is not effective due to a short barrel. This is due to the lack of time spent in the barrel to gain any appreciable velocity from the extra pressure of a +P powder load. If you have larger pistol & a smaller one, the +P can be an advantage in one, and a detractor in the other, but not enough to make my buy both rounds. As L.E. I need an absolutely reliable and effective round as do civilians. This round meets the bill for sure. Accurate as any round made. Perfect for my Shield and full size M&P9. Chrono'd 1060fps out of 3.1in shield. Fed perfectly and muzzle blast was minimal. Accuracy was good. Like always, LG shipping was lightning fast. Great ammo . Shoot at the range 4 boxes of 50 each . Perfect . A high quality, reliable expanding, hard hitting round. If your life depends upon it, you can depend on this round. It's all I shoot in my little Sig P938. Very accurate, too. Got these for a Kahr PM9 with 3.1" barrel. Consistently clocked at around 1030 to 1050 fps. A little more snap than 124gr Federal HydraShocks (which clocked around 930 fps out of the same pistol) but around 100 fps faster. No malfunctions or failures in 60 rounds. The shape of the nose of these bullets do make them a very close fit in the PM9's magazine, but it never had any issues firing them. 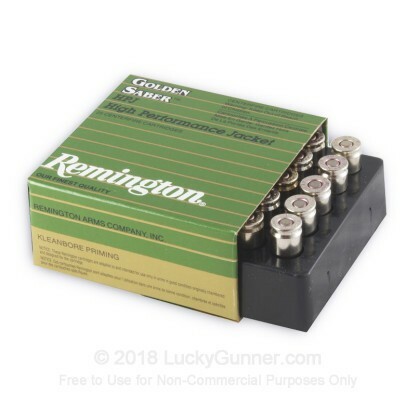 I purchased four box for defense but took one to the range to get a feel for the +P rounds. Felt awesome pushing them down range. I have always gotten the best service from LG, fast delivery, good prices, and quality merchandise. Pricey but not intended for plinking. What's your life worth? I guess the price is not important for this product! I bought this as a home defense round for a Glock 19 and Sig P229-1. I took it out to my brother in laws house and shot up some 2x4's and wooden pallets. They shot straight through 2 2x4's and got lodged into the 3rd one. Then I shot some 124gr federal ammo and it stopped in the second 2x4. The federal rounds also expanded while the golden sabre's did not. I figured if I had to fire through something like a door and hit someone on the other side and have it stop inside the would be assailant than the federals probably a little bit safer as it won't or didn't over penetrate like the golden sabre did. For some reason the golden sabres didn't even expand, they were slightly deformed and the cavity was filled with wood but they did not expand. The main reason for jacketed hollow points is for the round to stop inside of your target and not penetrate through and possibly hit an innocent bystander. I will most likely be going with the 50 round boxes of 124gr federal ammo. But even with that being said I will be buying more because of the price point and even thought I don't plan on shooting into any vehicles it also may have it place in my book. I have shot about 500 rounds of these rounds. The rounds shot true, and clean. I carry these rounds in my gun at work and know they will do the job right. Lucky Gunner is an honest advertiser. 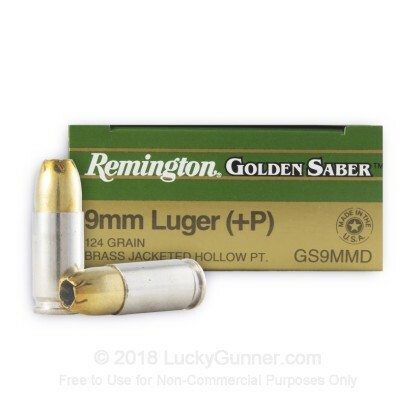 I have used this golden sabre ammo in 9mm 40 cal and 45, And never had a problem in fact. This is my choice when it comes to self defense rounds, I carry it every day at work, so you could say I bet my life on it. Performs very well but a little pricy. It is of course my defense round not for paper punching. A little pricy, but available if it's listed. Excellent delivery time. Haven't tried this batch out, but I've been very pleased with LG in the past. This ammo is the best and I got it in 2 days after my order this is the best company to purchase from they have quality ammo and very fast shipping. They have ammo when no one else does. I have searched every where to get 9mm ammo for my Springfield 9mm 9 XD but could not find it but they have it here. What can I say 10*+ on every thing!!! I gave it a 3* on value because of the price but the ammo is very good! Use this ammo for self defense. I had never had a misfire in My Browning Hi-Power, great accuracy (I do my part), feeds well and low flash. I have tried it myself at night. Plus the heavier grain compared to 115gr puts more impact power. I load up on this ammo and shoot a couple of boxes to stay up to date. I had 2 misfires so far and that isn't good when we are using them for self defense. Otherwise I am pleased with the ammo. This is good stuff. Tried alot of different kinds before settling on this. Good terminal performance, doesn't break apart. Clean reliable feeding and it goes bang every time. Works with all my brands of mags and 9mm weapons. If you ever NEED defensive power, you'll be so happy with yourself for having picked these up. Great ammo for the CCW weapon. A bit pricey, but definitely worth knowing it will fire every time, especially for a self defense load. 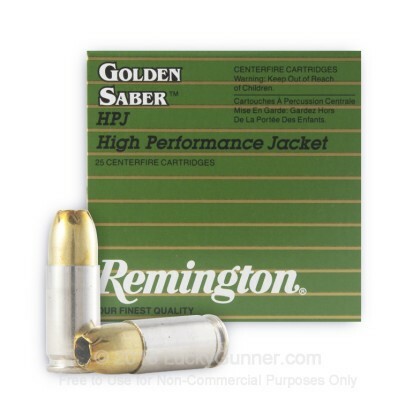 This ammo is clean firing, accurate and a good value for the quality. Had some problems with my favorite winchester ammo feeding in my CZ 75. The design of this bullet feeds much better and still gets the job done. This stuff is great and works good on small game as well!!! One of the best ammo for self defense. It is a bit pricy though. But when it comes to assurance and reliability no one can argue. I use this ammo for my Taurus PT709 (Slim). Very accurate and reliable. My self defense CZ loves it. This is some of the best defense ammo on the market. Cycles smooth and clean.